An interesting recent talk by Wolf-Dietrich Niemeier. I've written about late Neandertals becoming more AMH-like, and a new study on an Italian specimen that postdates the arrival of AMH in Europe lends some further support to that idea. The Mezzena jaw has Neandertal mtDNA and shares a number of morphological traits with other Neandertals, but its overall shape places it within the cluster of modern humans (triangles; figure on the left). Notice also that Qafzeh 9 (Q9) and Shkul V (SV) are also within the cluster of modern humans, and Spy 1 (a Neandertal) is actually closer to modern humans than to other Neandertals. The position on the scatter plot of our specimen of interest, Mezzena, has been calculated a posteriori. Unsurprisingly, the Mezzena mandible does not present any particular affinities with mid-Pleistocene specimens. It is most similar to AMHs being positioned within the H. sapiens cloud of points and the DFA classifies the specimen with modern humans (Table S7). Especially its shape is similar to that of Ohalo II and to a lesser extent to the recent modern human specimen China5. However, it should be noted that its position also indicates affinities with some Neanderthal specimens: the late Neanderthal Spy 1 and Saint-Césaire, the Near-East specimens Tabūn II and Amud 1, and to a lesser extent the classic Neanderthals La Ferrassie 1 and Guattari III (Figure 2). In this light, we can interpret the position of the Mezzena mandible which stands within the modern human shape space, while presenting strong shape similarities with some Neanderthal specimens. Such a conflicting taxonomical position is not surprising, considering the geological age of the mandible . Indeed, numerous late Neanderthals such as Spy 1, Saint Césaire and the Near-East mandibles Amud 1 and Tabun II possess hints of a chin (i.e. tuber symphyseo) though not a true modern human morphology , . Late Neanderthals lived in area where AMHs might have been already present , , , while the Levantine fossils are displaying a less derived Neanderthal morphology , . Therefore, in our view, this change in morphology of the mandibular chin among the fossils of Mezzena and other late Neanderthals could have been the result of a small degree of interbreeding with AMHs. 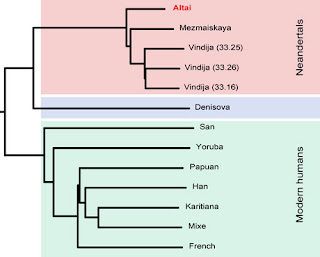 It would be interesting to sequence Mezzena to confirm the existence of AMH admixture. The Beagle page doesn't show version 4 yet, but I'm sure it will eventually turn up there since this paper has just been published. Segments of identity by descent (IBD) detected from high-density genetic data are useful for many applications, including long-range phase determination, phasing family data, imputation, IBD mapping and heritability analysis in founder populations. We present Refined IBD, a new method for IBD segment detection. Refined IBD achieves both computational efficiency and highly accurate IBD segment reporting by searching for IBD in two steps. The first step (identification) uses the GERMLINE algorithm to find shared haplotypes exceeding a length threshold. The second step (refinement), evaluates candidate segments with a probabilistic approach to assess the evidence for IBD. Like GERMLINE, Refined IBD allows for IBD reporting on a haplotype level, which facilitates determination of multi-individual IBD and allows for haplotype-based downstream analyses. To investigate the properties of Refined IBD, we simulate SNP data from a model with recent super-exponential population growth that is designed to match UK data. The simulation results show that Refined IBD achieves a better power/accuracy profile than fastIBD or GERMLINE. We find that a single run of Refined IBD achieves greater power than 10 runs of fastIBD. We also apply Refined IBD to SNP data for samples from the UK and from Northern Finland, and describe the IBD sharing in these data sets. Refined IBD is powerful, highly accurate, easy to use, and is implemented in Beagle version 4. We are therefore disturbed that Brown (2012), though selecting those features that imply to him that LB1 could not be a cretin, does not also cite the many features in those same publications that imply cretinism, nor does he cite the many more features, both observational and quantitative implying cretinism, in Oxnard (2008), Oxnard et al. (2011), and Dennison et al. (2012). What is sorely needed is an independent review of, and free access to, the Liang Bua material. Brown (2012: LB1 and LB6 Homo floresiensis are not modern human (Homo sapiens) cretins, Journal of Human Evolution) makes errors of fact, omission and interpretation. Brown's comments refer, among others, to (1) delayed growth and development indicated by unfused epiphyses, (2) postcranial limb proportions: limbs to trunk, between limbs, and within limbs, (3) postcranial bone torsions and angles, (4) postcranial robusticity, real and apparent, (5) skull features, and (6) cretinism on Flores. In each of these areas, much information about cretins is incorrect and much information (Oxnard et al., 2010) comparing the Liang Bua remains with cretins is ignored. The three PCs are color-coded in panels b,c,d. Genetic variation in a population can be summarized through principal component analysis (PCA) on genome-wide data. PCs derived from such analyses are valuable for genetic association studies, where they can correct for population stratification. We investigated how to capture the genetic population structure in a well-characterized sample from the Netherlands and in a worldwide data set and examined whether (1) removing long-range linkage disequilibrium (LD) regions and LD-based SNP pruning significantly improves correlations between PCs and geography and (2) whether genetic differentiation may have been influenced by migration and/or selection. In the Netherlands, three PCs showed significant correlations with geography, distinguishing between: (1) North and South; (2) East and West; and (3) the middle-band and the rest of the country. The third PC only emerged with minimized LD, which also significantly increased correlations with geography for the other two PCs. In addition to geography, the Dutch North–South PC showed correlations with genome-wide homozygosity (r=0.245), which may reflect a serial-founder effect due to northwards migration, and also with height (♂: r=0.142, ♀: r=0.153). The divergence between subpopulations identified by PCs is partly driven by selection pressures. The first three PCs showed significant signals for diversifying selection (545 SNPs - the majority within 184 genes). The strongest signal was observed between North and South for the functional SNP in HERC2 that determines human blue/brown eye color. Thus, this study demonstrates how to increase ancestry signals in a relatively homogeneous population and how those signals can reveal evolutionary history. 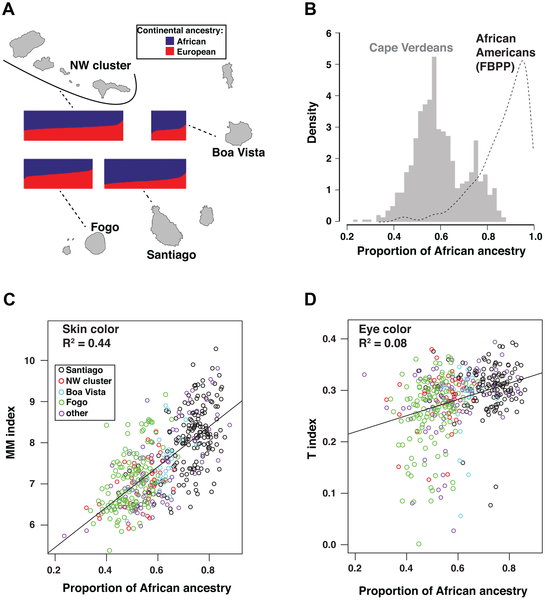 The interesting thing about this paper is that it shows that one can explain skin color in people from Cape Verde better if one uses their proportion of African/European admixture, rather than by looking at individuals' genotypes at loci associated with the trait. 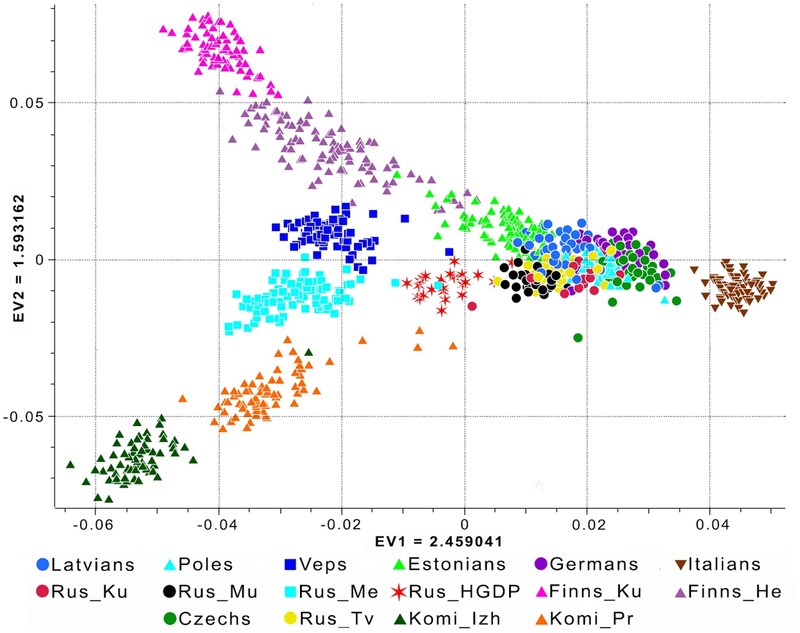 This probably means that many loci of minor effect on the trait differentiate Europeans from Africans. Prediction of skin color based on ancestry is much better than prediction of eye color from the same, which is not surprising since skin color is a highly polygenic trait. Variation in human skin and eye color is substantial and especially apparent in admixed populations, yet the underlying genetic architecture is poorly understood because most genome-wide studies are based on individuals of European ancestry. We study pigmentary variation in 699 individuals from Cape Verde, where extensive West African/European admixture has given rise to a broad range in trait values and genomic ancestry proportions. We develop and apply a new approach for measuring eye color, and identify two major loci (HERC2[OCA2] P = 2.3×10−62, SLC24A5 P = 9.6×10−9) that account for both blue versus brown eye color and varying intensities of brown eye color. We identify four major loci (SLC24A5 P = 5.4×10−27, TYR P = 1.1×10−9, APBA2[OCA2] P = 1.5×10−8, SLC45A2 P = 6×10−9) for skin color that together account for 35% of the total variance, but the genetic component with the largest effect (~44%) is average genomic ancestry. Our results suggest that adjacent cis-acting regulatory loci for OCA2 explain the relationship between skin and eye color, and point to an underlying genetic architecture in which several genes of moderate effect act together with many genes of small effect to explain ~70% of the estimated heritability. The haplogroup J(M304) Y chromosomes are all in subgroup J2(M172). However, Eaaswarkhanth et al. 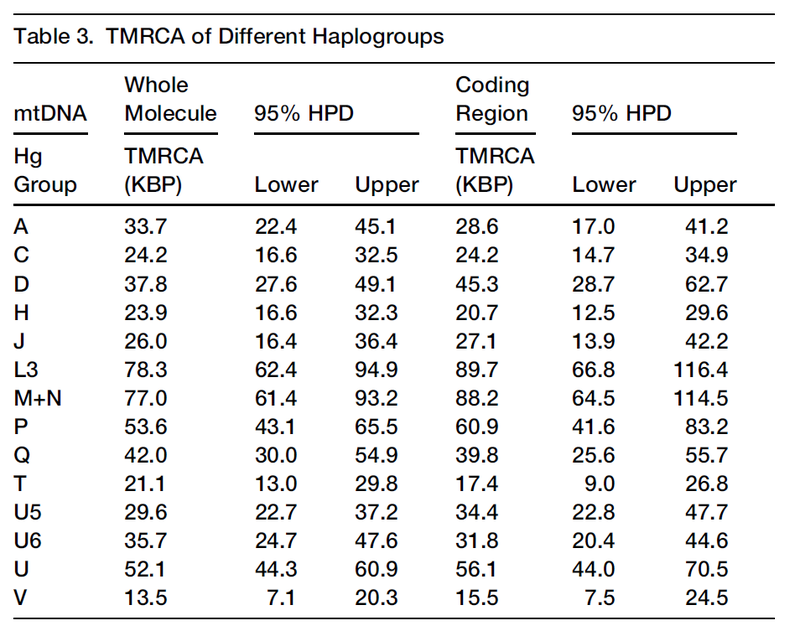 (2010) report that Muslims and non-Muslims in India largely have the same Y-haplogroup frequency distribution, except that in Muslims low frequencies of Y-E1b1b1a(M78), Y-J(M304)(xJ2(M172)), and Y-G(M201) are found that are absent in non-Muslims (Eaaswarkhanth et al., 2010). In our Maldivian sample, none of those Y-haplogroups were found. The Maldives are an 850 km-long string of atolls located centrally in the northern Indian Ocean basin. Because of this geographic situation, the present-day Maldivian population has potential for uncovering genetic signatures of historic migration events in the region. 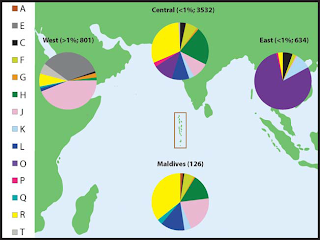 We therefore studied autosomal DNA-, mitochondrial DNA-, and Y-chromosomal DNA markers in a representative sample of 141 unrelated Maldivians, with 119 from six major settlements. 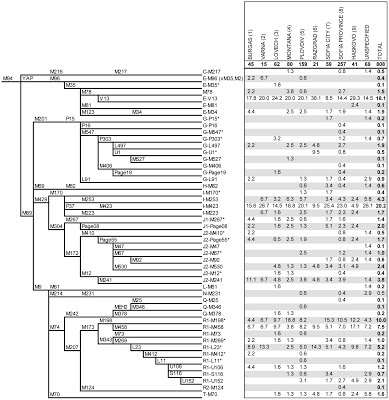 We found a total of 63 different mtDNA haplotypes that could be allocated to 29 mtDNA haplogroups, mostly within the M, R, and U clades. We found 66 different Y-STR haplotypes in 10 Y-chromosome haplogroups, predominantly H1, J2, L, R1a1a, and R2. 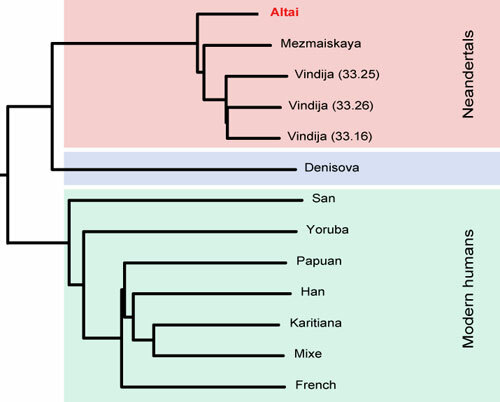 Parental admixture analysis for mtDNA- and Y-haplogroup data indicates a strong genetic link between the Maldive Islands and mainland South Asia, and excludes significant gene flow from Southeast Asia. Paternal admixture from West Asia is detected, but cannot be distinguished from admixture from South Asia. Maternal admixture from West Asia is excluded. Within the Maldives, we find a subtle genetic substructure in all marker systems that is not directly related to geographic distance or linguistic dialect. We found reduced Y-STR diversity and reduced male-mediated gene flow between atolls, suggesting independent male founder effects for each atoll. Detected reduced female-mediated gene flow between atolls confirms a Maldives-specific history of matrilocality. In conclusion, our new genetic data agree with the commonly reported Maldivian ancestry in South Asia, but furthermore suggest multiple, independent immigration events and asymmetrical migration of females and males across the archipelago. Am J Phys Anthropol 000:000–000, 2013. © 2013 Wiley Periodicals, Inc.
An excess of congenital defects is certainly compatible with high levels of inbreeding, and the publication of the Denisova genome clearly suggested "extremely low" genetic diversity in that Pleistocene human. It'll be interesting to see if more ancient DNA data will reveal high levels of inbreeding consistent with the abundance of genetic abnormalities evident in the anthropological record. The Max Planck institute has posted their high-coverage Neandertal genome on their site. The data can be downloaded from here. They had done the same with the high-quality Denisova genome, and it's great that they're making data available ahead of the official scientific publication, as this allows others to start using it much earlier. It then appears that Neandertals occupied the same cave as the elusive Denisovans. When? I guess we'll have to wait to find out, but the preliminary genetic analysis shown on the figure (top-left) makes it clear that the "Altai" specimen marked in red which is the source of the high-coverage Neandertal genome does indeed group with other Neandertals, while Denisova is more related to Neandertals than to modern humans. I've highlighted this before, but it bears repeating: divergence between Neandertals and Denisovans --who were in the same place (Denisova cave), perhaps some thousands of years apart-- seems to exceed that found between any two modern human groups which span the entire Earth. The age and cave origin of these remains may conceivably make them useful for ancient DNA studies. The Kalamakia cave, a Middle Paleolithic site on the western coast of the Mani peninsula, Greece, was excavated in 1993–2006 by an interdisciplinary team from the Ephoreia of Paleoanthropology and Speleology (Greek Ministry of Culture) and the Muséum national d'Histoire naturelle (Paris). The site is dated to between ca. 100,000 and >39,000 years BP (Before Present) and has yielded Mousterian lithics, a rich fauna, and human remains from several layers. The latter include 10 isolated teeth, a cranial fragment and three postcranial elements. The remains represent at least eight individuals, two of them subadults, and show both carnivore and anthropogenic modifications. They can be identified as Neanderthal on the basis of diagnostic morphology on most specimens. 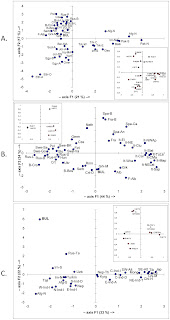 A diet similar to that of Neanderthals from mixed habitat is suggested by our analysis of dental wear (occlusal fingerprint analysis) and microwear (occlusal texture microwear analysis), in agreement with the faunal and palynological analyses of the site. These new fossils significantly expand the Neanderthal sample known from Greece. Together with the human specimens from Lakonis and Apidima, the Kalamakia human remains add to the growing evidence of a strong Neanderthal presence in the Mani region during the Late Pleistocene. It is generally understood that foxtail millet and broomcorn millet were initially domesticated in Northern China where they eventually became the dominant plant food crops. The rarity of older archaeological sites and archaeobotanical work in the region, however, renders both the origins of these plants and their processes of domestication poorly understood. Here we present ancient starch grain assemblages recovered from cultural deposits, including carbonized residues adhering to an early pottery sherd as well as grinding stone tools excavated from the sites of Nanzhuangtou (11.5–11.0 cal kyBP) and Donghulin (11.0–9.5 cal kyBP) in the North China Plain. Our data extend the record of millet use in China by nearly 1,000 y, and the record of foxtail millet in the region by at least two millennia. The patterning of starch residues within the samples allow for the formulation of the hypothesis that foxtail millets were cultivated for an extended period of two millennia, during which this crop plant appears to have been undergoing domestication. Future research in the region will help clarify the processes in place. Desiree C. Petersen et al. Within-population genetic diversity is greatest within Africa, while between-population genetic diversity is directly proportional to geographic distance. The most divergent contemporary human populations include the click-speaking forager peoples of southern Africa, broadly defined as Khoesan. Both intra- (Bantu expansion) and inter-continental migration (European-driven colonization) have resulted in complex patterns of admixture between ancient geographically isolated Khoesan and more recently diverged populations. Using gender-specific analysis and almost 1 million autosomal markers, we determine the significance of estimated ancestral contributions that have shaped five contemporary southern African populations in a cohort of 103 individuals. Limited by lack of available data for homogenous Khoesan representation, we identify the Ju/'hoan (n = 19) as a distinct early diverging human lineage with little to no significant non-Khoesan contribution. In contrast to the Ju/'hoan, we identify ancient signatures of Khoesan and Bantu unions resulting in significant Khoesan- and Bantu-derived contributions to the Southern Bantu amaXhosa (n = 15) and Khoesan !Xun (n = 14), respectively. Our data further suggests that contemporary !Xun represent distinct Khoesan prehistories. Khoesan assimilation with European settlement at the most southern tip of Africa resulted in significant ancestral Khoesan contributions to the Coloured (n = 25) and Baster (n = 30) populations. The latter populations were further impacted by 170 years of East Indian slave trade and intra-continental migrations resulting in a complex pattern of genetic variation (admixture). The populations of southern Africa provide a unique opportunity to investigate the genomic variability from some of the oldest human lineages to the implications of complex admixture patterns including ancient and recently diverged human lineages. The intermediate position of some Russian groups between Komi and the main body of Europeans. 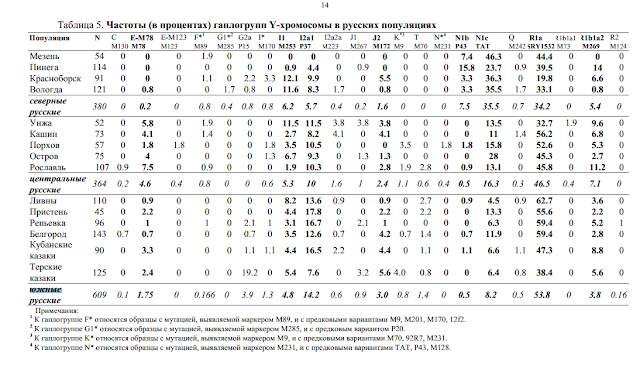 Andrey V. Khrunin et al. Ancient bodies lie buried beneath Stonehenge, but what can they tell us about Britain's greatest prehistoric monument? One man has found vital clues to this ancient puzzle. The researchers believed as many as 4,000 people gathered at the site, at a time when Britain's population was only tens of thousands. The academics suggested that Stonehenge was built about 200 years earlier than previously thought, some 4,500 years ago. In the rise and wane of the cremation ritual I have hinted at the possible rise of the cremation ritual as a way of disposing of the dead in a way that would make their remains portable. Not sure what the current research has discovered but "cremated remains" + "builders from far" makes for a good combination. If you do watch and learn something that might interest blog readers, feel free to leave a comment. 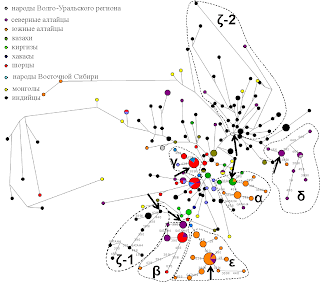 In conclusion, our analyses support the hypothesis that the Altai specimen is more closely related to domestic dogs than to extant wolves, but we stress the point that these analyses were limited to a single, maternally inherited locus and more sequence data would be needed to obtain a statistically well supported phylogeny and unambiguously resolve the genetic relationship of the Altai specimen. However, this preliminary analysis affirms the conclusion that the Altai specimen is likely an ancient dog with a shallow divergence from ancient wolves. These results suggest a more ancient history of the dog outside the Middle East or East Asia, previously suggested as centres of dog origin. Additional discoveries of ancient dog-like remains are essential for further narrowing the time and region of origin for the domestic dog . An ancient dog with shallow divergence from ancient wolves is probably what we might expect if dogs had been domesticated by some of the first Upper Paleolithic Eurasians a few thousand years prior to the date of this particular specimen. 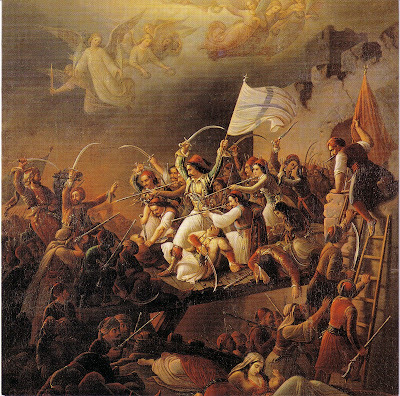 Anna S. Druzhkova et al. Bulgaria had been something of a blank area in studies of uniparental markers, so it's nice to finally see a comprehensive Y-chromosome study of the country. The dates in the paper are based on the "evolutionary mutation rate". I suspect that ancient DNA will be the final arbiter in this issue, because, for example, a Mesolithic TMRCA of E-V13 in Bulgaria implies that we'll find a lot of it in Neolithic contexts, whereas a Bronze Age one implies that we'll find a little if any of it, and a discontinuity across time. 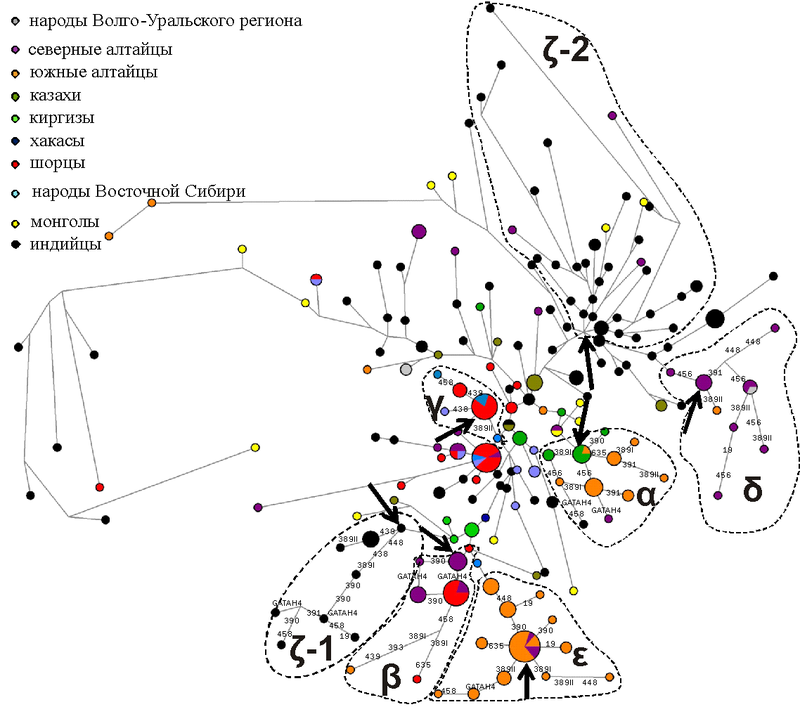 Of interest is the occurrence of some E*(xM35, M2) in this sample in Burgas, Varna, and Plovdiv. It would be interesting to trace the ancestry of the bearers of these Y-chromosomes. 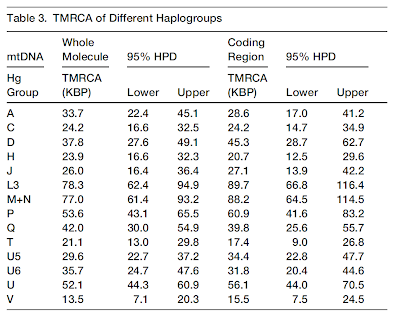 I know that there still exists a minority-within-a-minority of Black Muslims in Greek Thrace, and it's not inconceivable that these Y-chromosomes may represent the legacy of a similar population; in any case, their haplotypes can be found in Table S5 for anyone wanting to investigate. 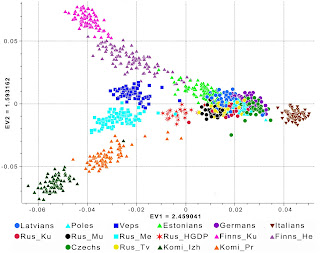 SNP Diversity within R seems substantial, and as always, it is difficult to say much, since this may be a consequence of either (i) a plausible role of the Balkans as a staging point of the likely invasion of Europe in late prehistory, or (ii) back-migration of derived R-bearers into the Balkans, be them Slavs or Goths or "eastern" folks of various stripes during history. Once again, I suspect that ancient DNA might solve this riddle, or, alternatively, routine high-coverage sequencing of the Y chromosome that might inform us, e.g., about the TMRCA of a Bulgarian and a German R-U152 or a Bulgarian and Polish R-M458. 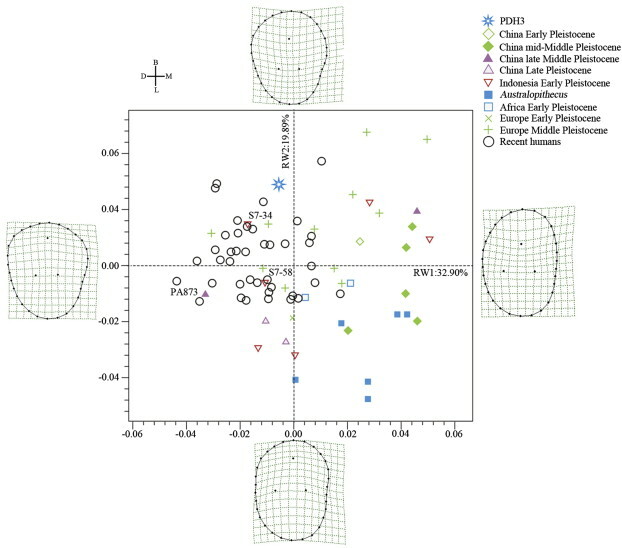 The Panxian Dadong P3 falls in the upper left quadrant, an area that, with the exception of two out of the nine Atapuerca-SH specimens and S7-34, is exclusively occupied by recent humans. 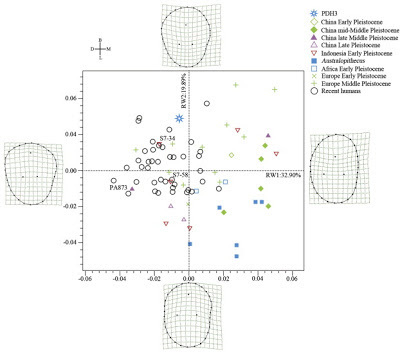 Thus this geometric morphometric analysis indicates that the general crown conformation of the Panxian Dadong P3 resembles some European Middle Pleistocene hominins, Chinese Upper Pleistocene hominins, and particularly the recent human specimens. According to the above comparisons, the Panxian Dadong P3 preserves some primitive and highly polymorphic traits, but in general its conformation is derived. Its occlusal morphology is simple, and the contour is symmetrical with a lingual cusp that is narrower than the buccal one. All these features make the Panxian Dadong P3 most similar to Upper Pleistocene hominins and recent humans in our comparative samples. I suspect that the age of these teeth will render them useless for ancient DNA work. The hominin teeth and evidence of hominin activities recovered from 1991 to 2005 at the Panxian Dadong site in South China are dated to the late Middle Pleistocene (MIS 8–6 or ca. 130–300 ka), a period for which very little is known about the morphology of Asian populations. The present study provides the first detailed morphometric description and comparisons of four hominin teeth (I1, C1, P3 and P3) from this site. Our study shows that the Panxian Dadong teeth combine archaic and derived features that align them with Middle and Upper Pleistocene fossils from East and West Asia and Europe. These teeth do not display any typical Neanderthal features and they are generally more derived than other contemporaneous populations from Asia and Africa. However, the derived traits are not diagnostic enough to specifically link the Panxian Dadong teeth to Homo sapiens, a common problem when analyzing the Middle Pleistocene dental record from Africa and Asia. These findings are contextualized in the discussion of the evolutionary course of Asian Middle Pleistocene hominins, and they highlight the necessity of incorporating the Asian fossil record in the still open debate about the origin of H. sapiens. Relative to other mammal groups, rabbit bone abundance was always significantly higher during the Upper Palaeolithic (76%) and Mesolithic (59%) than during the Middle Palaeolithic (Fig. 4). The difference between the average rabbit remains and that of cervids, the second most abundant prey item, were less than 10% during the Mousterian. In contrast, during the Upper Palaeolithic and Mesolithic, the difference between the rabbit and the second-most important prey items was over 60% and 20%, respectively. After the rabbit, large ungulates (caprids, cervids and equids) were relatively important during the Middle and Upper Palaeolithic, while caprids, cervids and suids took that place during the Mesolithic (Fig. 4). Our evidence indicates that hominin diets may have changed from one dependent on large mammals during the Middle Palaeolithic to diets dominated by smaller species in the Upper Palaeolithic, in particular by the wild rabbit. The explanation for this transition is either that climate change negatively impacted large mammal populations, forcing prehistoric people to incorporate smaller vertebrate species into their diets, or that people themselves negatively impacted large mammal populations, which in turn forced foragers to add smaller species to their diets. 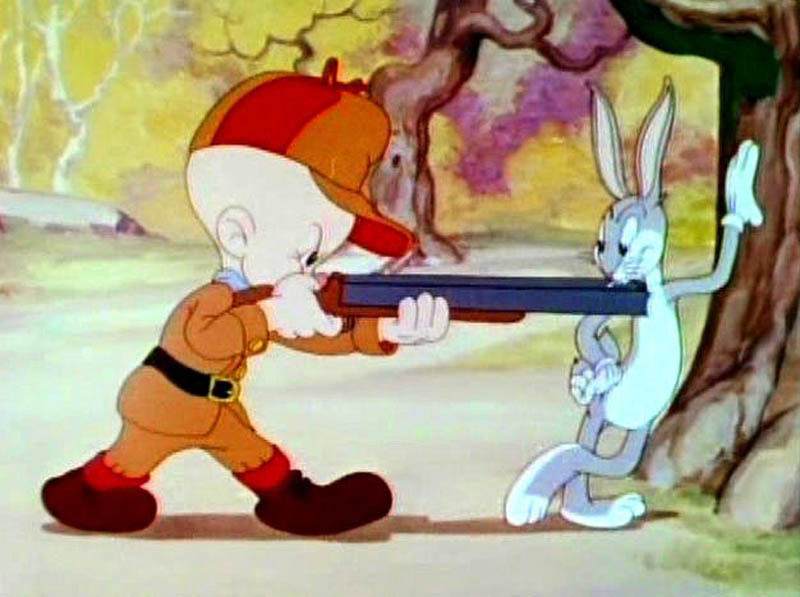 I am not sure how modern hunter-gatherers hunt rabbits, but I would think that trapping, or some type of slingshot or blowdart would be ideal for this small and fast-moving animal. Did Neandertals simply lack efficient technology to capture rabbit, or is there some other reason why they underutilized the species? John E. Fa et al. High dependence on the hunting and consumption of large mammals by some hominins may have limited their survival once their preferred quarry became scarce or disappeared. Adaptation to smaller residual prey would have been essential after the many large-bodied species decreased in numbers. We focus on the use of a superabundant species, the rabbit, to demonstrate the importance of this taxon in Iberia as fundamental to predators. We show that the use of the rabbit over time has increased, and that there could have been differential consumption by Neanderthals and Anatomically Modern Humans (AMH). Analysis of bone remains from excavations throughout Iberia show that this lagomorph was a crucial part of the diet of AMH but was relatively unutilised during the Mousterian, when Neanderthals were present. We first present changes in mammalian biomass and mean body mass of mammals over 50,000 years, to illustrate the dramatic loss of large mammalian fauna and to show how the rabbit may have contributed a consistently high proportion of the available game biomass throughout that period. Unlike the Italian Peninsula and other parts of Europe, in Iberia the rabbit has provided a food resource of great importance for predators including hominins. We suggest that hunters that could shift focus to rabbits and other smaller residual fauna, once larger-bodied species decreased in numbers, would have been able to persist. From the evidence presented here, we postulate that Neanderthals may have been less capable of prey-shifting and hence use the high-biomass prey resource provided by the rabbit, to the extent AMH did. The African Sahel is conducive to studies of divergence/admixture genetic events as a result of its population history being so closely related with past climatic changes. Today, it is a place of the co-existence of two differing food-producing subsistence systems, i.e., that of sedentary farmers and nomadic pastoralists, whose populations have likely been formed from several dispersed indigenous hunter-gatherer groups. 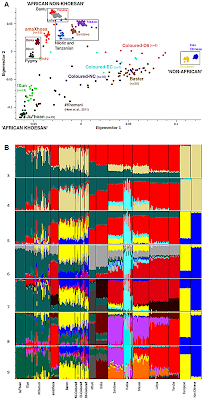 Using new methodology, we show here that the male gene pool of the extant populations of the African Sahel harbors signatures of multiple and differentiated contributions from different genetic sources. 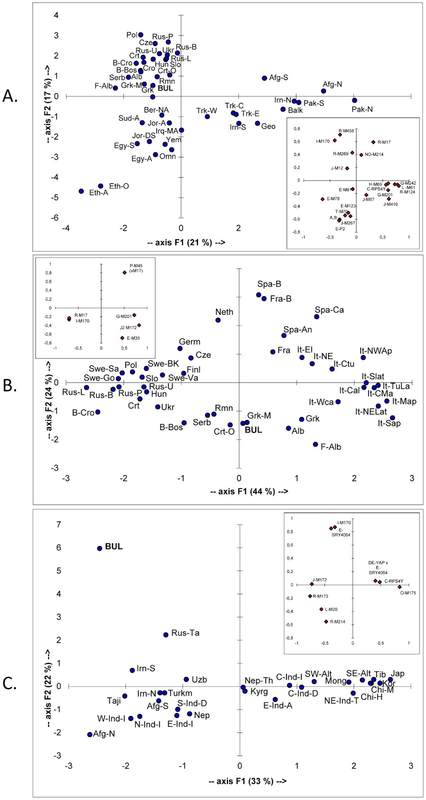 We also show that even if the Fulani pastoralists and their neighboring farmers share high frequencies of four Y chromosome subhaplogroups of E, they have drawn on molecularly differentiated subgroups at different times. These findings, based on combinations of SNP and STR polymorphisms, add to our previous knowledge and highlight the role of differences in the demographic history and displacements of the Sahelian populations as a major factor in the segregation of the Y chromosome lineages in Africa. Interestingly, within the Fulani pastoralist population as a whole, a differentiation of the groups from Niger is characterized by their high presence of R1b-M343 and E1b1b1-M35. Moreover, the R1b-M343 is represented in our dataset exclusively in the Fulani group and our analyses infer a north-to-south African migration route during a recent past. Razib points me to a new paper (and its associated data, consisting of Christian, Druze, and Muslim Lebanese). The Levant is a region in the Near East with an impressive record of continuous human existence and major cultural developments since the Paleolithic period. Genetic and archeological studies present solid evidence placing the Middle East and the Arabian Peninsula as the first stepping-stone outside Africa. There is, however, little understanding of demographic changes in the Middle East, particularly the Levant, after the first Out-of-Africa expansion and how the Levantine peoples relate genetically to each other and to their neighbors. In this study we analyze more than 500,000 genome-wide SNPs in 1,341 new samples from the Levant and compare them to samples from 48 populations worldwide. 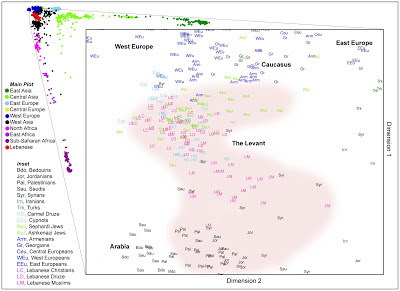 Our results show recent genetic stratifications in the Levant are driven by the religious affiliations of the populations within the region. 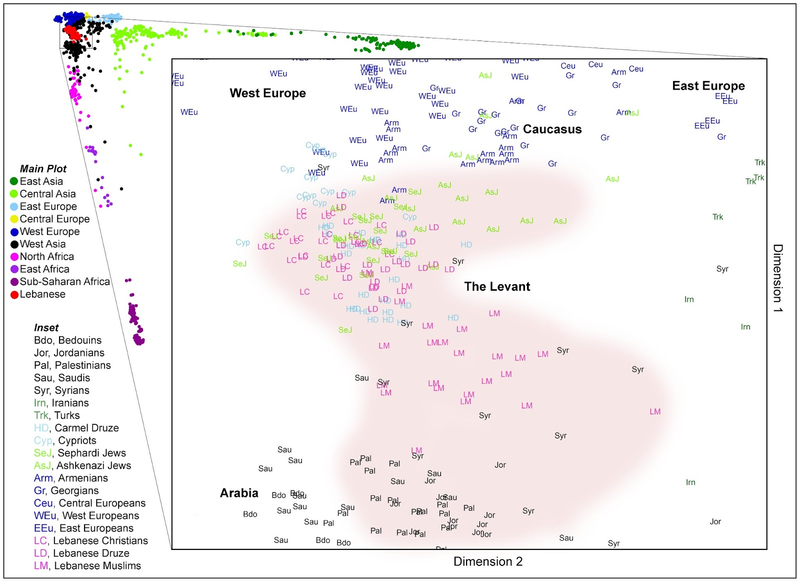 Cultural changes within the last two millennia appear to have facilitated/maintained admixture between culturally similar populations from the Levant, Arabian Peninsula, and Africa. The same cultural changes seem to have resulted in genetic isolation of other groups by limiting admixture with culturally different neighboring populations. Consequently, Levant populations today fall into two main groups: one sharing more genetic characteristics with modern-day Europeans and Central Asians, and the other with closer genetic affinities to other Middle Easterners and Africans. Finally, we identify a putative Levantine ancestral component that diverged from other Middle Easterners ~23,700–15,500 years ago during the last glacial period, and diverged from Europeans ~15,900–9,100 years ago between the last glacial warming and the start of the Neolithic. Hence, contrary to the authors' assertion that TPL1 has a “minimum secured age of 46 ka and a maximum age of ∼63 ka”, the published stratigraphy, if correct, indicates that the TPL1 specimen is no older than 46 ka. 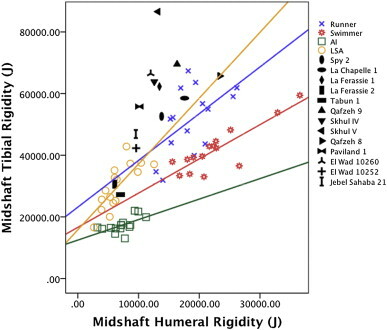 TPL1’s status as “the earliest well-dated modern human fossil east of the Jordan Valley” also appears weak compared with the Liujiang specimen dated to ∼153 ka (3), the Callao Cave fossil in the Philippines dated to 67 ka (4), and, above all, the ∼100 ka modern fossil from Zhirendong (5), discovered only 484 km northeast of Tam Pa Ling in Southern China. They question the validity of the dating because of an apparent “reverse stratigraphy” (Fig. 1), whereby “older” dates are located higher in the section [i.e., 51.4 (14C) at 2.1 m] and “younger” dates are at the bottom of the section [i.e., 48 ka (optically stimulated luminescence [OSL]) and >49.2 ka (14C) at 4.3 m] (2). This criticism ignores the presented SEs (table 2 and table S1 in ref. 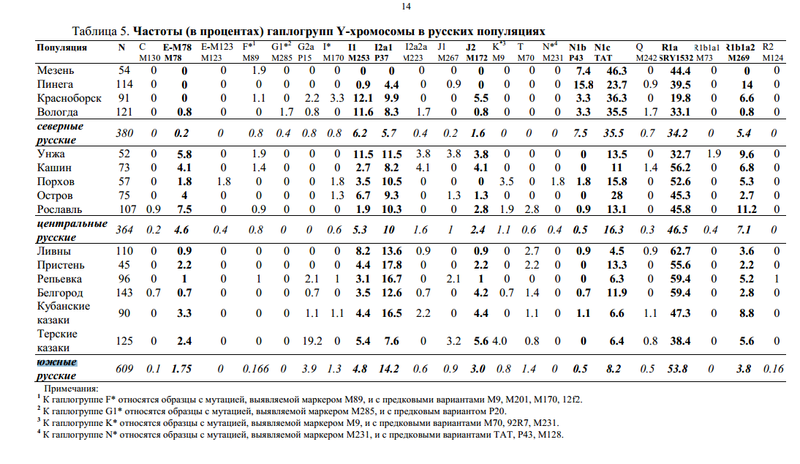 1), which make the results statistically equivalent (Table 1). More importantly, they ignore that the radiocarbon results are well beyond the accepted radiocarbon barrier of ∼40 ka (3), indicating that the charcoal has a minimum age of ∼40 ka. Bearing in mind these problems, we have conservatively estimated the burial age to be ∼46 ka according to the luminescence dating of the sediments. As the luminescence results are stratigraphically consistent, we perceive no irreconcilable differences between the stratigraphy and dating. Finally, we interpret TPL1 as the earliest human fossil that is both well-dated and fully modern in morphology. Zhirendong demonstrates a mixture of archaic and modern traits, making it significant but not fully modern in appearance (4). Similarly, the metatarsal from Callao Cave is only diagnostic to the genus Homo given that it falls within “the morphological and size ranges of Homo habilis and H. floresiensis” (ref. 5, p. 123). Although the modernity of the Liujiang fossil is not questioned, it has no direct date and no secure stratigraphic provenance. It has been variably dated to ca. 20 ka, ca. 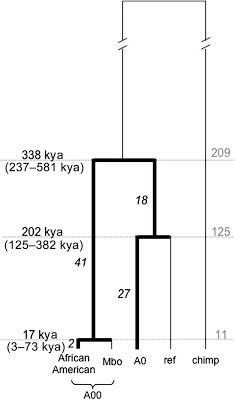 67 ka, 111 to 139 ka, and >153 ka (6), and this uncertain stratigraphic context has prevented many scholars from accepting any of the dates currently attributed to it (6). First, it forces us to consider the possibility of either (i) archaic admixture in Africa, or (ii) a much more ancient time depth of modern humans than the first fossils from Ethiopia dated to about ~200 thousand years ago. Second, it underscores the importance of collaboration between academia and regular folk, since it was the combined contributions of academics, genetic genealogists, and the owners of the new A00 basal Y-chromosomes that made this new discovery possible. And, third, it shows that the extraordinary can be discovered without contacting isolated tribes or seeking human bones in remote regions, but rather through careful scrutiny of large volumes of data for the proverbial needle in the haystack. If we were to use the higher mutation rate (1.0x10^-9 per base per year6) rather than a realistic range derived from whole-genome sequencing (4.39x10^-9 - 7.07x10^- 9), the estimated TMRCA for the tree incorporating A00 as the basal lineage would be 209 kya, which is only slightly older than current estimates of the TMRCA of mtDNA and the age of the oldest AMH fossil remains. We note, however, that the higher mutation rate produces an estimate for the common ancestor of all non-African Y chromosome haplogroups (C through T) of ~39 kya6 (i.e., versus ~63 kya for the mutation rate used here). A 39kya common ancestor for Eurasian Y-chromosomes makes no sense, since we now know for sure that by that time, the differentiation of Eurasians was already well on its way and modern humans in remote parts of the Old World have been documented much earlier than that time. A ~63kya common ancestor, on the other hand, fits nicely with my "two deserts" theory of modern human origins, according to which the ancestors of Eurasians faced an ecological crisis in Arabia when it became much drier post-70kya; that seems like a most opportune time for the major Eurasian bottleneck and the corresponding coalescence of Eurasian Y-chromosomes to a single man. And, while there is no a priori reason for Y chromosomes and mtDNA to behave similarly, the age of the "older" Eurasian ur-mother, haplogroup N at 59 thousand years, with presumably an older ancestor within mtDNA haplogroup L3 founding the Eurasian population. Also, if modern human-Neandertal admixture had occurred "most likely 47,000–65,000 years ago", then the expansion of modern Proto-Eurasians within a 70-60kya timeframe north Out-of-Arabia would have brought them in contact with their northern Neandertal neighbors. On the other hand, it would be incredible if modern humans experienced admixture with Neandertals but were still much later a very small population (to allow for the coalescence of their Y-chromosomes to one man ~39kya). So, in summary, the mutation rate used by the authors seems consistent with what we know about an important calibration point of the human story. But, who were the people in Africa responsible for the introgression of A00 chromosomes? Mendez et al. used the haplotype of the African American A00 individual and discovered his patrilineal kin among the Mbo of Cameroon, who are Bantu farmers. I have observed before that Pygmies and Bushmen represent only a tiny fraction of pre-existing African genetic diversity, the part that had not yet been absorbed into the farmers' expanding population by the time that Africa came to the attention of of modern science. We see traces of Pygmy and Bushman ancestry in some African farmers, and there were probably other groups, no longer extant as distinct ethno-cultural entities, but, nonetheless, surviving as genetic fragments in the genomes of the farmers. Thus, while it still makes sense to study the surviving hunter-gatherers of Africa who make up perhaps a percent or less of the population of Africa, it may be equally important to study different groups of African farmers who may possess a much richer treasure trove (albeit diluted) of such "Palaeoafrican" ancestry. 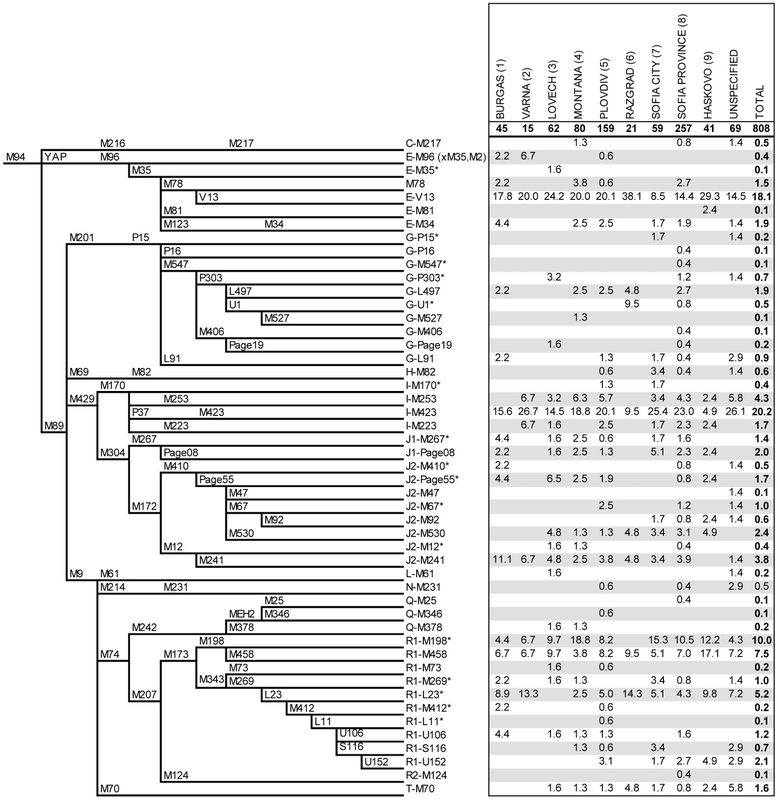 Although the stochastic nature of the evolutionary process can explain the aforementioned incongruences, the extreme age and rarity of the A00 lineage point to the possibility of a highly structured ancestral population, consistent with recent work on the autosomes.40,41,43,44 This could take the form of long-standing population structure among AMH populations45 or archaic introgression from an archaic form into the ancestors of AMHs.46 Interestingly, the Mbo live less than 800 km away from a Nigerian site known as Iwo Eleru, where human skeletal remains with both archaic and modern features were found and dated to ~13 kya.47 Further surveys in sub- Saharan Africa and in the African Diaspora might uncover more diverged basal lineages, which will help to disentangle some of the complex evolutionary processes that shape patterns of Y chromosome diversity. We report the discovery of an African American Y chromosome that carries the ancestral state of all SNPs that defined the basal portion of the Y chromosome phylogenetic tree. We sequenced ∼240 kb of this chromosome to identify private, derived mutations on this lineage, which we named A00. 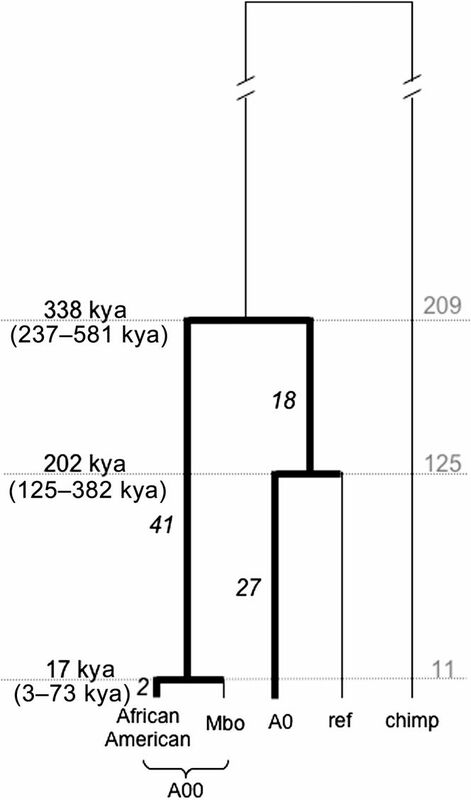 We then estimated the time to the most recent common ancestor (TMRCA) for the Y tree as 338 thousand years ago (kya) (95% confidence interval = 237–581 kya). Remarkably, this exceeds current estimates of the mtDNA TMRCA, as well as those of the age of the oldest anatomically modern human fossils. The extremely ancient age combined with the rarity of the A00 lineage, which we also find at very low frequency in central Africa, point to the importance of considering more complex models for the origin of Y chromosome diversity. These models include ancient population structure and the possibility of archaic introgression of Y chromosomes into anatomically modern humans. The A00 lineage was discovered in a large database of consumer samples of African Americans and has not been identified in traditional hunter-gatherer populations from sub-Saharan Africa. This underscores how the stochastic nature of the genealogical process can affect inference from a single locus and warrants caution during the interpretation of the geographic location of divergent branches of the Y chromosome phylogenetic tree for the elucidation of human origins.